The Dendroctonus ponderosae Hopkins is a small bark beetle about 4.0-7.5 mm in length. 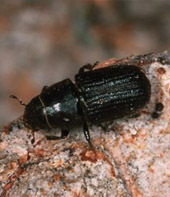 Commonly known as the mountain pine beetle (MPB), it is the most destructive pest of mature pine forests in North America. Alberta forests are being devastated by the mountain pine beetle and it is threatening our urban tree environment. When beetle populations are small, the beetles prefer stressed mature and over-mature (80+ years) pine trees. As beetle populations grow, any pine tree over 12.5 cm in diameter can be killed – even healthy trees. The MPB kills pine trees by clogging and destroying the conductive tissue of the tree by the beetle introducing blue-stain fungi when attacking the tree. Its larvae feed in the phloem of the tree. The action of blue-stain fungi and larval feeding can kill the tree within one month of the attack. To combat this pest, deadwood your conifer trees regularly and remove any infected trees immediately. Keep your spruce and pine trees healthy. Regular pruning, fertilizing and watering helps keep your trees and shrubs growing vigorously. For more information on the mountain pine beetle, visit the ‘Mountain Pine Beetle in Alberta’ website or contact us today.